Educating the minds of future global leaders requires a commitment to developing the skills necessary for this enormous task. Children who arrive at the Junior School each day are met with engaging, inquiry-based tasks that require them to think deeply about issues of global significance while simultaneously learning the key foundational skills necessary to access a higher level education. In the UNIS Junior School, teachers are committed to delivering academic excellence while honing investigative skills and critical thinking. Students are asked to use design thinking principles in integrated subject areas throughout the day. Our learning environment fosters intellectual growth, independence and acuity, purposeful curiosity and skills for the future. Our teachers are engaged in their students' lives, and take a team approach to a child's academic and emotional development. Junior School teachers are also focused on the socio-emotional growth of the children. They have a genuine affection and strong commitment to helping them succeed in school and in life. We have a strong pastoral care program which uses both Responsive Classroom morning meetings as well as the five foundations of character development: Responsibility, Organization, Persistence, Resilience and Getting Along. 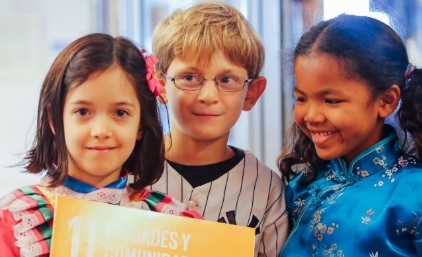 The ethnic, cultural and religious diversity of our student population and connection with the United Nations makes the global stewardship aspect of a child's experience come alive. Our students are steadily exposed to a variety of speakers and travel opportunities related to the United Nations. They leave the Junior School as strong advocates for the Rights of Children across the globe. Our students move on to the Middle School with values of honor, courage, trust and compassion strongly embedded. "The ethnic, cultural and religious diversity of our student population and connection with the United Nations makes the global stewardship aspect of a child's experience come alive."